Sharia Law Board Stuns The World Silent, Says "Those Who Oppose, Question, Or Do Not Accept The Sharia Will Be..."
It’s amazing the level of scrutiny that Christianity bears witness to each and every day when it comes to determining whether or not it is abiding by the law of the land. In certain states in the US, ministers’ sermons are even being subpoenaed or reviewed for the purposes of squirreling out those pesky pastors that are telling their flock to vote one way or another! Then there’s the attempt to shut them out of government completely; you know, freedom FROM religion instead of freedom OF religion. The atheists can have their say, the Buddhists can have their prayer, the Taoists can observe their faith, and witches can toss sage into a cauldron and compose a rhyme as they complete a Wiccan ritual (all within the confines of protocol set forth by watching Charmed, of course). But have a Christian say anything remotely close to the words, “In Jesus’ name, we pray…” and all Hell breaks loose. One religion that appears to trump all others in government, however, is Islam. If you’re a Muslim, you have a free pass to an all-expenses-paid trip to the Mecca of tolerance. You can utter any sort of nonsense in Arabic or in English and are still considered “in the club.” Recently, a Sharia Faisla Board announced that if Islam was not officially recognized, it will campaign to educate those who do not believe and, if that fails, they will be considered non-Muslims! Calling the Supreme Court’s verdict which ruled triple talaq unconstitutional as an “interference” in Islamic law, the Sharia Faisla Board (SFB), an umbrella body of prominent religious and social Muslim organizations in Telangana, said on Thursday that it will carry out a campaign to educate Muslims about Islam and the Sharia (Muslim personal law) in the coming days. It also said that those opposing the Sharia within the community will be considered non-Muslims. Mallik said that the SFB will carry out a door-to-door programme starting with Hyderabad to explain Muslims about Islamic jurisprudence. “Those who oppose, question or do not accept the Sharia or Islam, we will explain these things to them also. If they still are not convinced, then they will be ex-communicated from the religion and not be considered as Muslims,” he added. 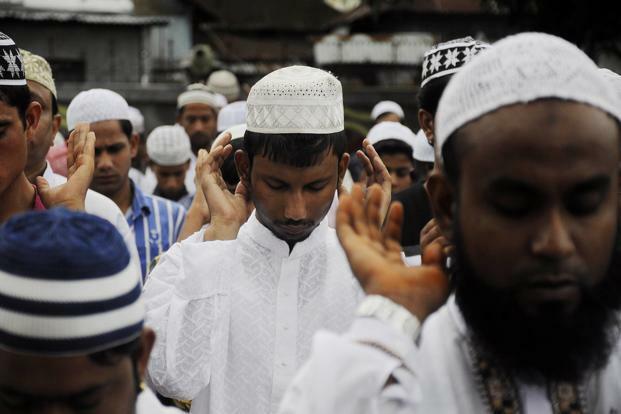 Both Mallik and Moulana Yousuf Zayed, chairman, Telangana Ulema Council (TUC), said that the RSS and the Bhartiya Janata party (BJP) are trying to interfere in the Muslim personal laws (Sharia). “This is one of the ways they want to push the demand for the Uniform Civil Code,” alleged Mallik. Think of this as the Jehovah’s Witnesses of Islam. They will go door-to-door to connect with other Muslims and attempt to convert them. If they don’t accept Sharia Law in accordance with their beliefs, they will be banished…from Islam, that is. While this is happening in India, the Hindus are battling the extremist views of the radical Islamists in Kashmir while basically expelling Christians from their nation completely. In the meantime, they have issues along their southern border with the Chinese Buddhists in that disputed territory as well. For people that say we have a lot of problems here in the States, they certainly haven’t been to India.